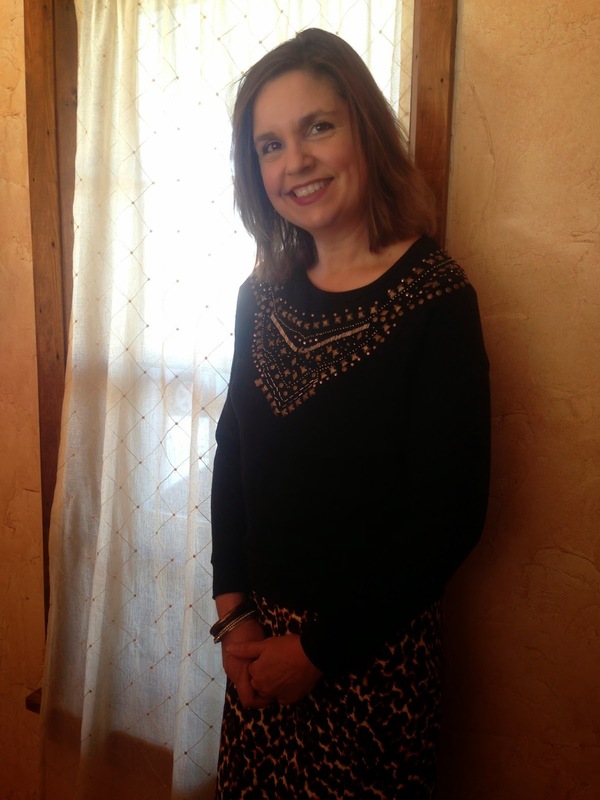 Amy's Creative Pursuits: Mix It Up! Hello! One of my favorite things I like to do when putting together outfits is to mix dressier items with casual ones. I like to have that "dressed up look", yet not sacrifice my comfort. 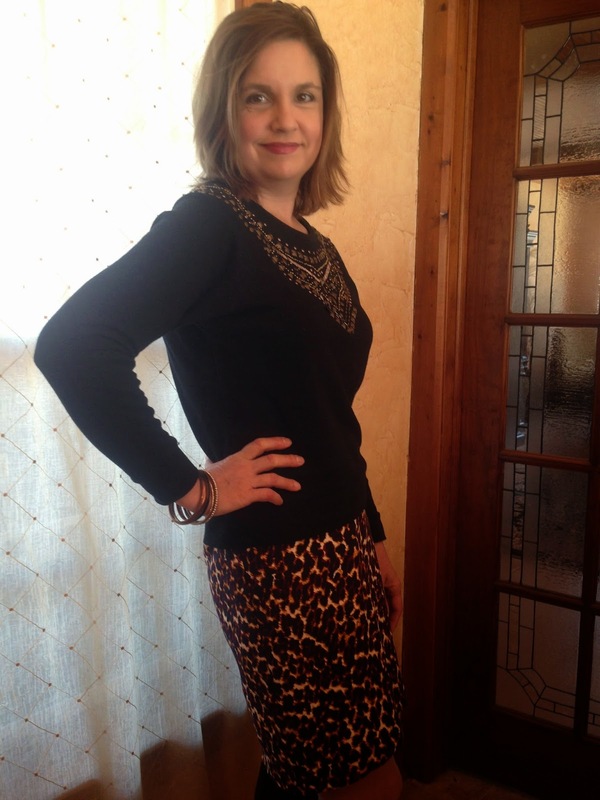 For today's outfit I took a leopard skirt and paired it with an embellished sweatshirt. You heard me right, a sweatshirt! It was so cozy and warm to wear, and I thought the two looked great together. When my daughter saw this outfit she said "I never would have thought of pairing those two items together". Which is pretty funny, because both items are thrift store findings of hers that she has had hanging in her closet for years. Sometimes, all we need is for someone else to play in our closet, you know what I mean? If you start to feel that 'you have nothing to wear even though your closet is filled to the brim, don't go out and buy new clothes, just ask a friend to come over and see what outfits they would put together with the clothes you already have. You'd be surprised at the different combinations they would come up with that you never thought of before. It's called a fresh pair of eyes! I have Ashley do it for me with my clothes as well. It really helps to get more out of your wardrobe. 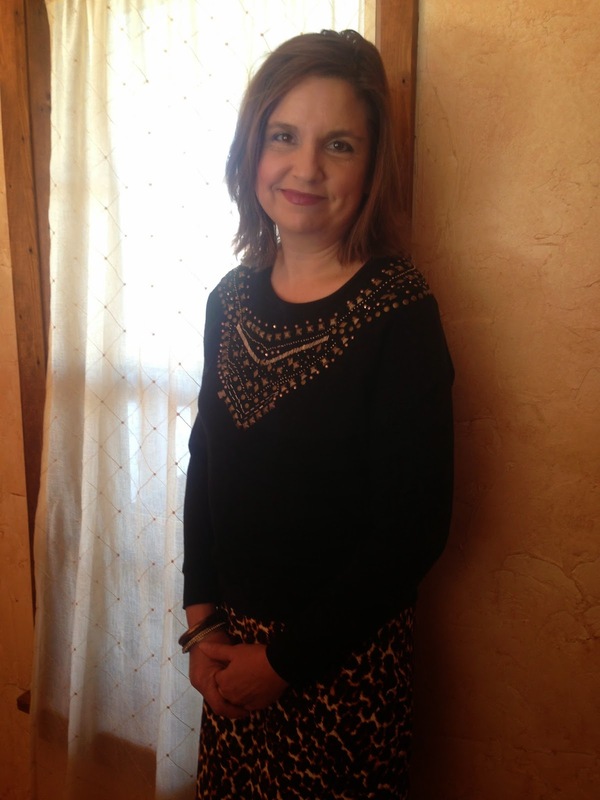 Even though the sweatshirt and the skirt are two completely different types of fabrics and categories of clothing, they work together because the embellishment in the sweatshirt brings the top up a level, and the colors coordinate well with the skirt. The sweatshirt also has a nice, form-fitting shape which keeps the silhouette classy and feminine. A typical bulky sweatshirt, you know the kind…with all the extra fabric right in the mid-section, would never work. So the style, and shape of the top is also what makes this two very different items compliment each other. I just love all the pretty copper studs in this top. I echoed the colors in the top with copper and gold bracelets. I wore my Famous Footwear black boots to complete the ensemble. 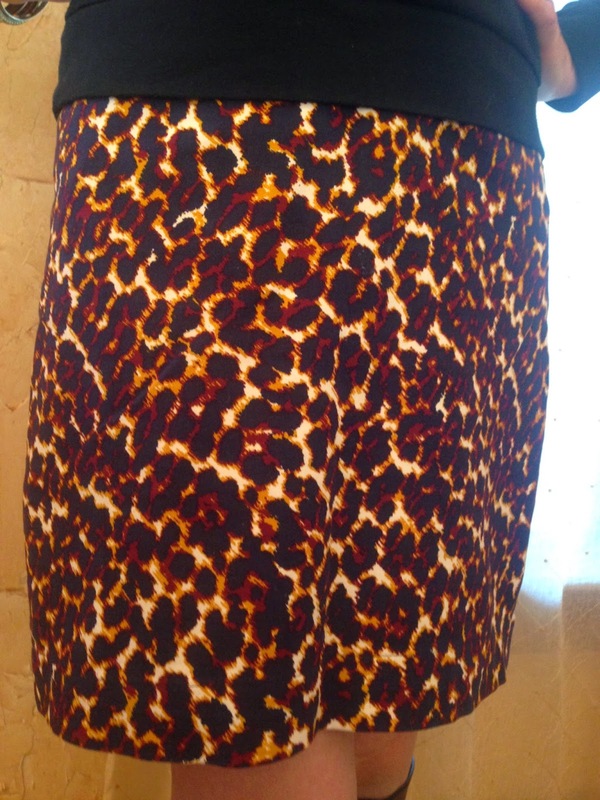 Here are some close ups of the print on the skirt. 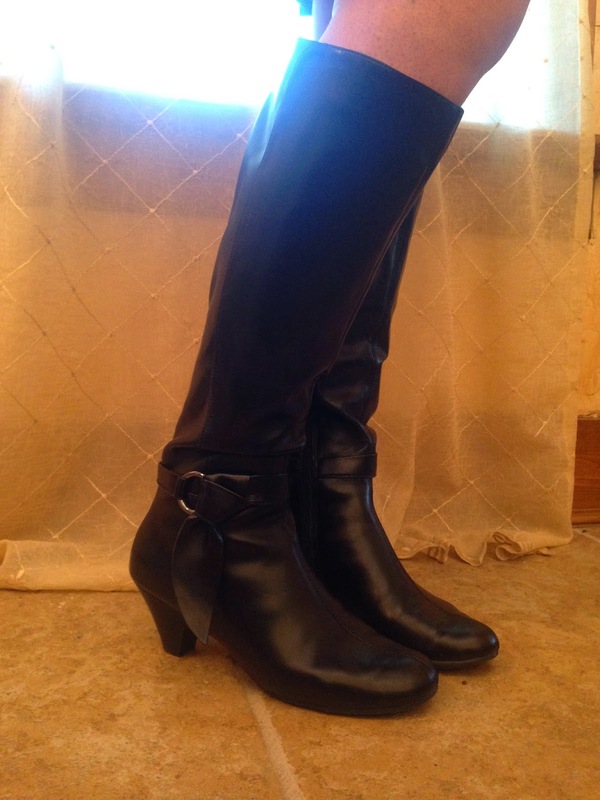 Very classy and traditional, so the trendier top and boots really balance the look out so that it is not too stuffy. This is another outfit that went home with Ashley when she was last here to visit. I think I might have to get it back when I see her next month. I forgot how much I liked it! I never really like classic, dressy looks. I think I feel like it's not me when I wear them. That I'm just pretending to be someone else. But when I mix something more casual with the classic item, then suddenly I feel myself again. It's odd how clothes can affect how we feel isn't it? But it is so true! So what about you? Do you like to mix the styles of your clothes, or do you wear one style at a time? I'd love to hear from you! Linking up with Trendy Wednesday. Hi Amy, I loved your photos of your wonderful outfit. You look great! My outfits doesnt look so nice as yours. Yes I also like to mix several styles and maybe I will post a photo of one on my blog in the future. I bought last week a skinny (!!!!!) jeans in animal print hihi and try it on already. It looks great but sometimes a little voice says something else, you know what I mean. But women of our age (I am 52) are sometimes a little bit too careful. Bi bi and have a nice week. I am absolutely loving that skirt! Anything leopard print is just amazing. 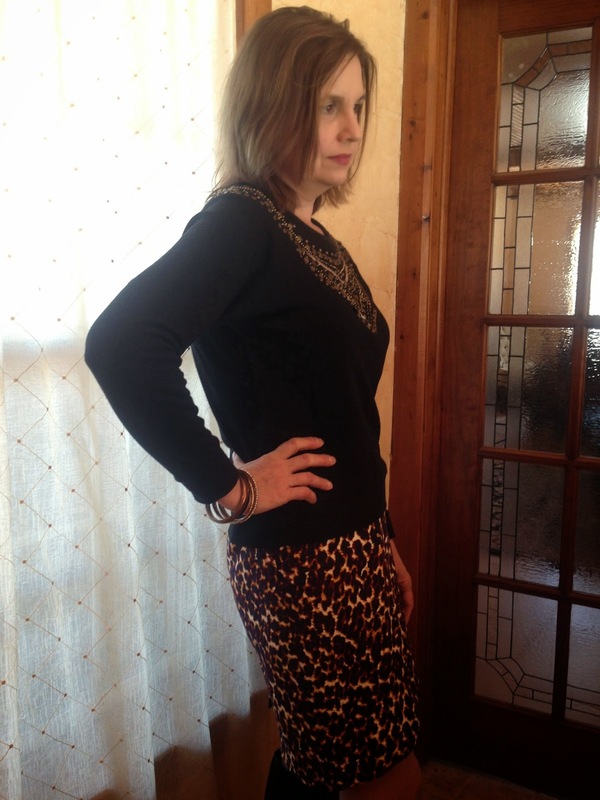 I love the embellished sweatshirt with the leopard skirt! Such a cute look! 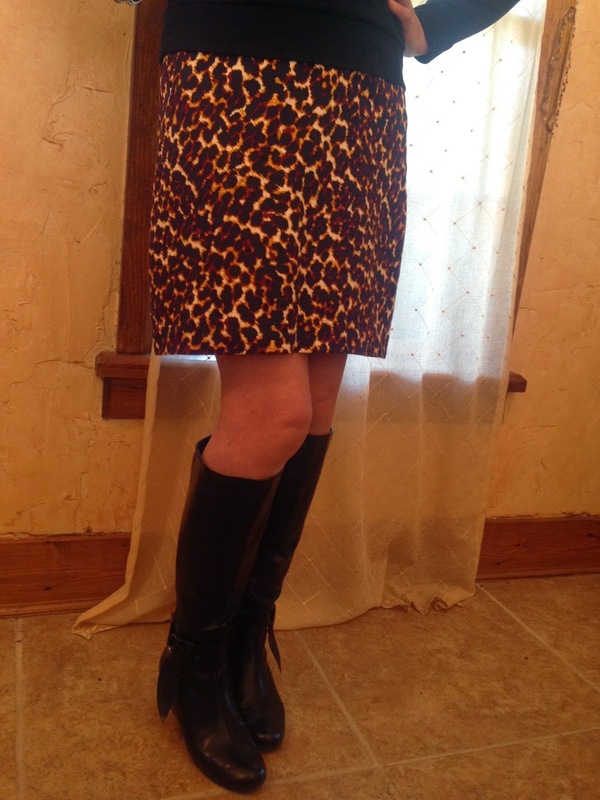 I have been wanting a leopard print skirt! I love dressy yet casual looks, they're the best!